Congratulations to all the fans in Winnipeg on the return of an NHL team! While the time may not yet be right for Hartford, the dedication and enthusiasm shown by the fans in Winnipeg are an inspiration for those in Hartford. It can happen. The NHL can return. If the television ratings from Game 1 of the Stanley Cup playoffs are any indication, Hartford’s interest in hockey is growing, which is great to see. 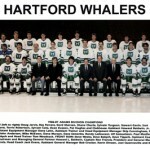 Please continue to support the Connecticut Whale and some day what we’re seeing in Winnipeg may just happen in Hartford!